PORTLAND — Students at Peaks Island Elementary School recently unveiled a new way to see the island and learn its history. The students in Charlie Marenghi’s second- and third-grade classroom spent the year making a Landmark Bike Tour brochure, marked by 24 landmarks around the island. Marenghi said each student in the class had one landmark to research, study and eventually draw. “We chose three (of the landmarks), and we would write about it and then choose,” second-grader Scarlett Rocque said. Marenghi said each student had to write a paper about which landmark they wanted. He read them, and most students ended up with their first or second choice. The students worked with Bridgette Kelly from the Maine Bicycle and Pedestrian Safety Education, a partnership between the Bicycle Coalition of Maine and the Maine Department of Transportation, to make the map. Kelly said she made the map, and the students didlandmark expedition for the nearly four-mile ride. “We first started talking about it in March, but it wasn’t full time, it was pieced together little by little until the (unveiling) event on May 1,” Kelly said. Marenghi said the students began with a first-draft drawing of their landmark, which several said was difficult since they had never seen their landmarks or were unfamiliar with them. They included well-known sites like the school itself, the Inn on Peaks Island and the ferry landing, to less-noticed landmarks like Trout Pond and the beaver lodge. “We did a walking tour of the island, I think it was in October, the weather wasn’t too bad yet. But then we had a long winter which is when we studied because we couldn’t get out, that’s when did all our research,” Marenghi said. In researching their landmarks, students went out into the community and spoke with parents, neighbors, family friends and others. “It really pushed them out into the community and it’s what we wanted, to interview people and use their interview skills to find out what (they) need to know about (their) landmark,” Marenghi said. Kelly said it was also a good way for the students to spread the message of bike safety. “It’s a meaningful way for them to go outside of school and into the community,” she said. Marenghi said the map doubles as an educational card game known as “Top Trump Cards,” which helps the students learn historical facts about all the landmarks. “You can learn about the island and some of the landmarks on the island,” said third-grader Bella Green. She said the facts on the cards include when the landmark was built, how tall it is, its width and how long it has been in use. The point of the game is to end up with all the cards in the deck. “So you would pick from (the four categories) and if I picked ‘date built’ and the card you were using (was older) than mine you would win, and if you got all of my cards then you would win (the game),” Green said. “You might have a building that’s taller or a building that’s older or a building that’s longer, and that way they ingest that information in a fun way,” Marenghi added. The students said the game was fun and worth all the work. “It’s a fun way to learn and some people don’t know about the island,” second-grader Olivia Boyle said. The project received a Safe Routes to School mini grant, which Kelly said was used for printing 1,000 maps for distribution. 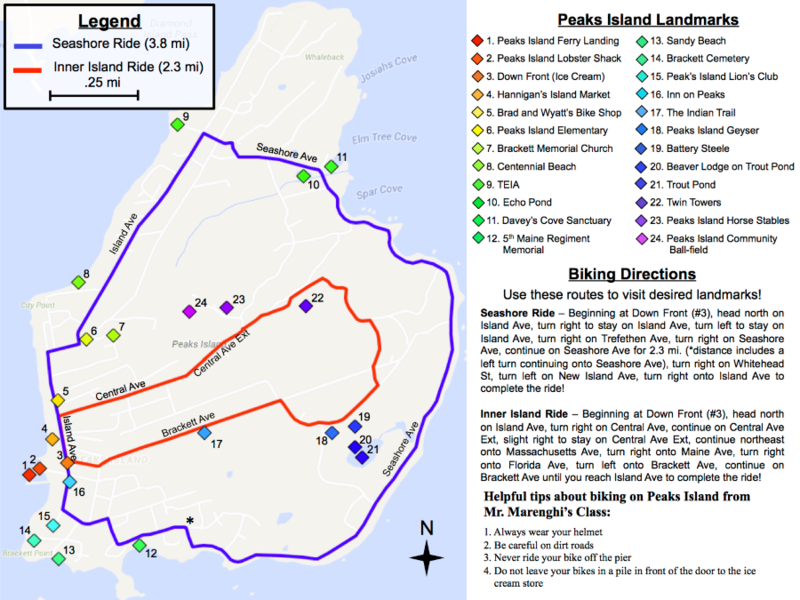 The maps will be available for free at the Casco Bay Lines ticket office and Brad’s Bike Rental & Repair on Peaks Island. Additional funding from the mini grant was put towards multi-sport helmets for the students.